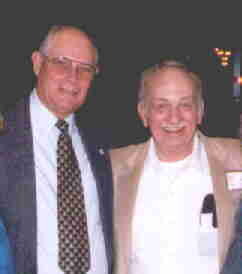 Photo from Reunion 2000 in Norfolk VA, John A. Lovejoy a member of the 376's first crew meets Ronald E. Fox a members of the second crew. 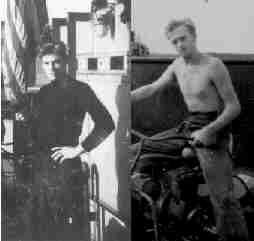 Left John A. Lovejoy on the deck of LCT 376 in 1942, before being shipped to the south pacific. Right is Ronald E. Fox on the deck of the 376 at the Island of Emiru 1944/45 in the south pacific. Click above for the NEW World War II landing craft tanks main page. Check out the free downloads section for LCT wallpaper and screensaver for your windows 95/98/NT/2000 computer . Quoted from the introduction in the book TO FOREIGN SHORES U.S. Amphibious Operations in World War II By John A. Lorelli. "Everyone interested in World War II history knows American soldiers and marines made many amphibious landings, often against fierce opposition. But most people know little about the men and the craft used to land the troops.The reason amphibious forces have remained comparatively unsung is clear: amphibious warfare is simply not glamorous. 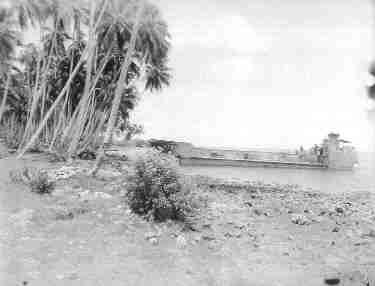 Ships that lift assault forces are large and clumsy,lacking the sleek lines of destroyers or the formidable presence of the aircraft carrier. While combat and news photographers were usually present in droves to record landings,far fewer stayed to cover the mundane task of unloading supplies." As in the book this web page seeks to redress this imbalance. 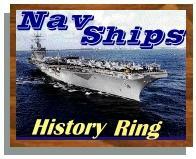 This NavShips History-Ring site owned by Ronald E. Fox .